hosted by Beverly at How Sweet the Sound. Please visit her to see many other participants showing off their pink eye CANDY! 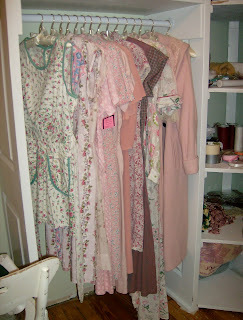 Today I thought I'd share some of my pink vintage dresses. Since we're building a storage area in my craftroom, (no~ still not finished, weekends only and we've been doing other things instead), I wanted to have an area to hang some vintage things for show. Most of them are from the 30's or 40's, some 50's. 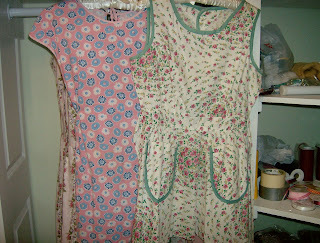 These first two are aprons. However, they meet all way in the back and I've been wanting to adjust the closures so that I can wear them for blouses. The pink and green one has such a cute rose motif. 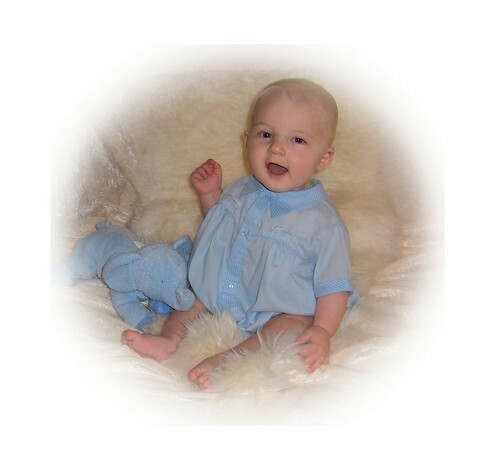 You may click the photos to enlarge if you wish, just remember to hit the back button to return. 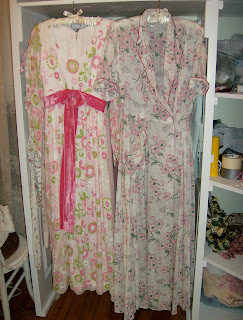 The dress on the left was a gift from a fellow collector. 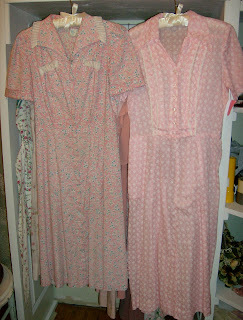 The one on the right is one of my faves with great PINK buttons! It needs a few repairs, I've worn it quite a bit. Here's a closeup of the darling embroidered design on the one. I may have featured this dress below on the left before. It is one of my all time favorite vintage dresses. I found it "new with tags". The dress on the right I got on my birthday, yet I haven't had a chance to wear it yet. Just haven't felt like styling my hair properly, etc. lately. I think as soon as I color my hair red again, I'll have my vintage "mojo" back, lol! I bought the dress at the Vintage Haberdashery in St. Louis. 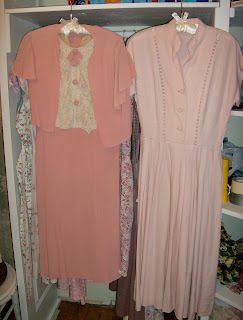 I adore the coral pink shade of the 30's crepe dress on the left. 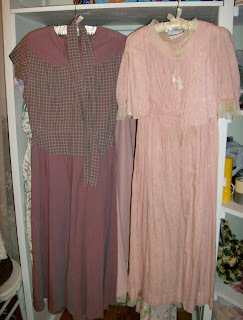 And the texture of the linen dress on the right. Ok, you caught me. The dress below isn't vintage. It's a $3 Walmart clearance cheapie. But it's one of my lazy day favorites! 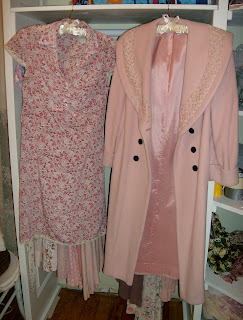 I bought this coat, (probably circa 80's or 90's) on ebay to embellish into Rose's pink coat from Titanic. I've changed out the buttons but that's as far as I've gotten! This plum colored dress is so cool because it's cotton, yet it's iridescent. Changes from plum to green. Just awesome. 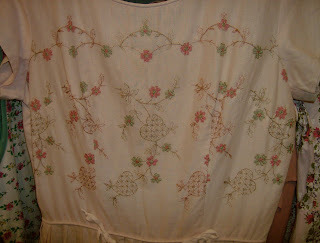 Next to it is one of my oldest dresses, to too small for me... it's a teen or pre-teen's garment from about 1912. Just darling. Perhaps I'll do a Pink Saturday post on that one alone some time! Ah... I HATE to alter vintage via cutting it up, unless it's too far gone with stains or rot. 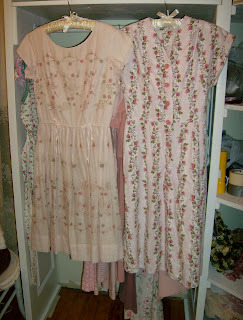 But this vintage 60's or 70's dress on the left is just TOO scrumptious to let go. I plan to cut part of the length off, and add it to the bust and waist so I can wear it. Incredibly selfish me thinks, but I just HAVE to do it. I beleive the dress next to it is actually a dressing gown, made of nylon. 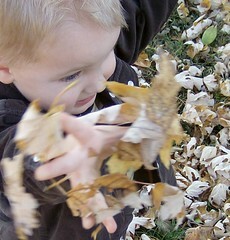 It has some repairs to be made too... and I'm thinking of hemming it. I just love the dogwood pattern on it! I hope you've enjoyed seeing these pink frocks! I have recently shared some new pink in my life. In the previous post, the background on the table is actually a vintage full size bedspread that I bought for only $8!! I'm using it as a tablecloth for now. And a few more posts back I shared a baby scale from the 50's. Wonderful, wonderful retro pink. WOOT! Thank you everyone for your well wishes on my new ETSY shop! 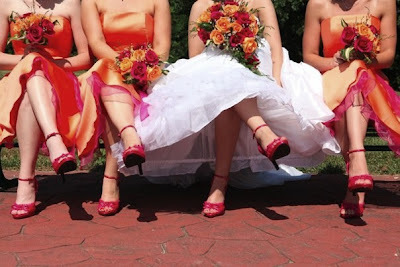 Ok, ok.... so I'm still stuck on the pink shoes we wore in my sister's wedding. They are So freakin' cute! I hope to resume my shoe hoarding posts to normal soon. However, today's post is special. 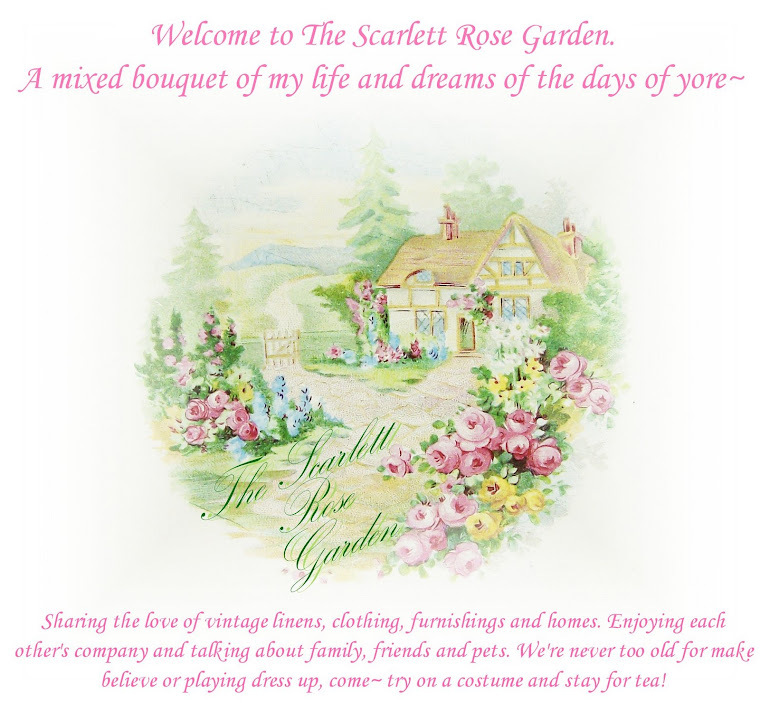 I have joined Etsy to bring you The Scarlett Rose Garden Shop. "A mixed bouquet of vintage fashoin & handmade goods." Shoes are my main focus right now. 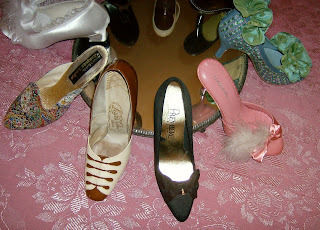 These are some of the shoes that I have listed, or am getting ready to list. 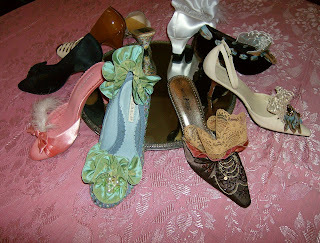 They are either vintage or embellished. 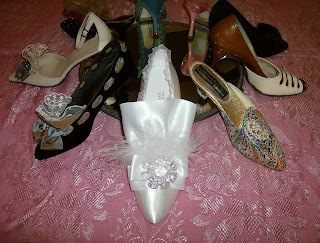 When I got married over 8 years ago, I searched high and low for Marie Antoinette style shoes. I burned my eyes out on the internet and could only find shoes for $200 or more. I ended up finding a black pair in a thrift store, and I "reupholstered" them with the fabric from my wedding dress. Today, they are still hard to find. There is really only one shoe that shows up for retail, and it runs between $50 and $70. 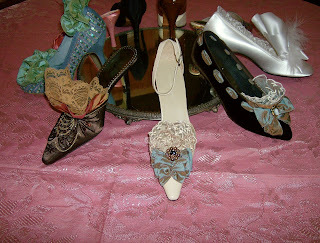 And yet, the heel is too spikey and not so 18th century looking. 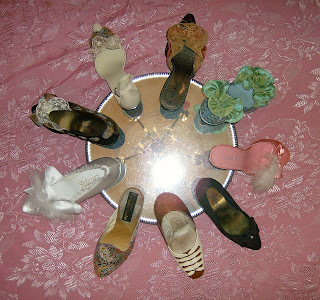 So I have decided to alter shoes to resemble colonial and victorian times, or a mixture of modern day with the past. It has kept me quite busy lately! And that vintage pink baby scale I showed you recenlty? It will come in handy to weigh things for shipping! Cool, eh? I would love to hear from my fellow blogger friends who have Etsy shops as well! We have one P-Oed cat. She does not like the vet. But now that she's home she is getting back to her normal, lovable self. The vet said she was urinating fine there, but since I've had her home for a few hours, she has tried to go several times and I see nothing in the box. I'm trying not to worry at this point, I'm sure she has some funny sensations going on. I'll be sure to monitor it though. Other than that she seems fine, and is getting around well. Thanks for your concern folks!